Southbound at Exit 16A, Interstate 575 passes through the lowest level of semi directional T interchange with Georgia 20-140 west and Georgia 5 Business north in Canton. Photo taken 05/27/07. Georgia Route 713 was the designation given to Interstate 575 during construction. Interstate 575 (unsigned Georgia 417) is the 31-mile Phillip M. Landrum Memorial Highway, which serves the far northern suburbs of the Atlanta metropolitan area. It is cosigned with Georgia 5 throughout while the old alignment of Georgia 5 parallels as a local road, maintained by either the county or city through which it passes. 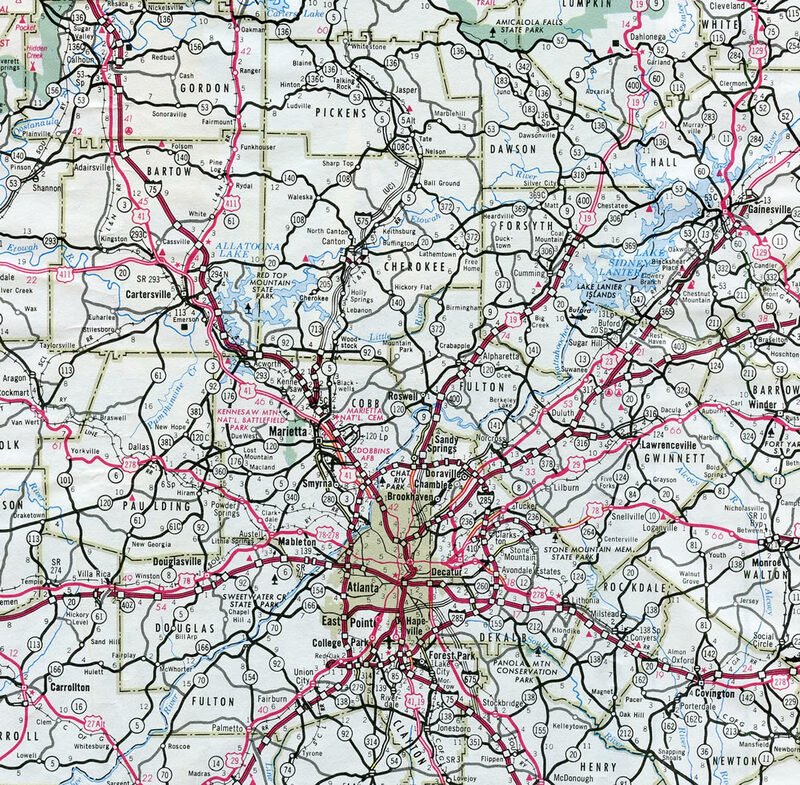 The freeway connects Interstate 75 at Marietta with Nelson via Woodstock, Canton and Holly Springs along the Georgia 5 corridor. West of Nelson, when Interstate 575 crosses the Cherokee/Pickens County line, the route transitions directly onto Georgia 515 (ARC Corridor A), an at-grade expressway. Georgia 5 extends north along side Georgia 515 as the Appalachian Developmental (APD) Highway / Zell Miller Mountain Parkway to Ellijay. The Northwest Corridor project underway between November 2013 and September 8, 2018 constructed 29.7 miles of two reversible toll lanes along both Interstates 75 and 575 north of the Perimeter Highway (I-285). The express lanes extend north along I-575 to the Sixes Road interchange (Exit 11). Costs were estimated at $834 million for the entire project. Interstate 75 north to Georgia 92 (Exit 7) – construction began in April 1978, opened on October 16, 1980. Georgia 92 (Exit 7) north to Georgia 5 Business / Riverstone Parkway (Exit 20) – construction began in 1981, opened on March 29, 1985; this incorporated the two-lane Georgia 20 bypass of Canton between Exits 16A and 19 that was built in 1978. Georgia 5 Business / Riverstone Parkway (Exit 20) north to Georgia 372 / Howell Bridge Road, opened in 1987. Georgia 372 & Georgia 5 Business tie into the north end of I-575 via an expressway spur southeast to old Georgia 5 (Ball Ground Highway / Canton Highway). Georgia 372 back tracks along this route south to Ball Ground as part of a 27-mile course to Alpharetta. Photo taken 05/29/07. A pair of End Limited Access 1500 Feet signs flank Interstate 575’s northbound lanes as the freeway spans Fairview Road beyond the Pickens County line. Ahead is the right turn to Georgia 372 and Georgia Business 5 southeast to Ball Ground. The pair overlap southeast 1.5 miles to Ball Ground Highway, where the expressway sees a stub end. Photo taken 05/29/07. Ball Ground Highway (old GA 5) extends north from Georgia 372 & 5 Business as an unnumbered route to Nelson and Tate. The route was formerly Georgia 756. Photo taken 05/29/07. There are two sets of end signs. The first set is posted prior to the Georgia 372 and 5 Business intersection. Photo taken 05/30/07. Interstate 575 ends and Georgia 515 (APD Highway) begins. GA 515 consists of a 76-mile route north through the Appalachian Highlands of North Georgia and the North Carolina state line near Lake Chatuge. The entire alignment shares pavement with U.S. Highways or state routes. Photo taken 05/30/07. Drivers from Georgia 5 Business & 372 north merge onto Georgia 515 (APD Highway) beyond this end shield. Georgia 515 travels mostly as an expressway to the merge with U.S. 76 at Ellijay. Photo taken 05/29/07. This end limited access sign for Interstate 575 was replaced between 2003 and 2007. Photo taken 08/22/03. Replaced shield assembly posted as I-575 intersects GA 372 & 5 Business south and GA 515 (APD Highway) north. All signs for GA 515 are blue on white. Photo taken 08/22/03. Southbound Georgia 515 (APD Highway) approaches the northern terminus of Interstate 575. The upcoming intersection sees Georgia 5 turn south onto I-575 while Georgia 5 Business & 372 both begin a shared alignment south into Ball Ground. Georgia 5 will parallel Interstate 575 from this point south to Marietta. Photo taken 05/29/07. Georgia 372 and Georgia 5 Business branch southeast from I-575 & Georgia 5 along 1.5-mile long expressway to Ball Ground Highway. Ball Ground Highway is the former alignment of GA 5 north to Nelson and south to Ball Ground. Photo taken 05/29/07. Interstate 575 bypasses Ball Ground to the west along a rural freeway to the original Canton Bypass (Georgia 20). Georgia 5 Business forms a loop east between the freeway beginning and Exit 27 with Howell Bridge Road. Photo taken 05/29/07. This set of shields was the first to announce the beginning of the nascent I-575 freeway from GA 5 & 515 south. The button copy shield for I-575 was replaced by 2003. Photo taken by James Pernikoff (1/20/02). Another button copy shield for Interstate 575 was posted at the at-grade intersection between Georgia 5, 515, 372 and 5 Business. It was replaced by 2003 as well. Photo taken by James Pernikoff (1/20/02). Approaching the diamond interchange (Exit 3) with Chastain Road on I-575 & GA 5 (Phillip Landrum Highway) south in Cobb County. The final two exits of Interstate 575 provide access to Interstate 75 north, which parallels just to the west. Photo taken 05/29/07. Chastain Road comprises a six lane arterial west by a number of business parks to a diamond interchange with Interstate 75. Photo taken 05/29/07. Continuing south, Interstate 575 crosses Big Shanty Road one mile ahead of Exit 1 with Barrett Parkway. Town Center at Cobb mall lies just to the west of this busy exit. Photo taken 05/29/07. Barrett Parkway provides a second connection to I-75 north while I-575 south defaults onto I-75 south via a wye interchange. Georgia 5 continues southward onto Interstate 75 for a brief overlap before departing at Marietta. Photo taken 05/29/07. An end shield precedes the I-575 & GA 5 southbound merge onto I-75 north of the Canton Connector. A new flyover ramp was constructed next to this assembly for the Northwest Corridor Express Lanes in 2016-17. Photo taken 05/29/07. Access to Interstate 575 northbound is not direct and requires motorists to navigate on area surface roads between the two freeways. The preferred route for Interstate 575 northbound from I-75 south is Chastain Road, accessible from Exit 271. Photo taken by Chris Patriarca (02/23/03). Interstate 75 southbound at the diamond interchange (Exit 271) with Chastain Road. Another 23 miles of I-75 remain between this exit and Downtown Atlanta. Photo taken by Chris Patriarca (02/23/03). Barrett Parkway provides another opportunity for southbound motorists along I-75 to access I-575 north back to Woodstock. Photo taken by Chris Patriarca (02/23/03). Interstate 75 northbound at Exit 267B for Georgia 5 southbound to Marietta. Georgia 5 overlaps with I-75 for the next mile before departing via Interstate 575 north at Exit 268. Georgia 5 and Interstate 575 share pavement for all 31 miles of freeway. The bridge placard indicates that the overpass is apart of Georgia Spur 5. In the state of Georgia, spur and connector routes are part of the overall state system. Arkansas also uses spur state routes and Nebraska uses Link routes that accomplish the same feat as the Georgia Connector series. Photo taken 07/11/10. Six lanes of Interstate 75 & Georgia 5 northbound progress to their split at Exit 268. Two lanes depart in 0.75 miles for the Interstate spur. Photo taken 07/11/10. The Interstate 575 & Georgia 5 control city is Canton, the Cherokee County seat located 17 miles to the north. Photo taken 07/11/10. The tree lined median here gave way for construction of the I-75 Express Lanes in 2015. A new ramp will provide access to the I-575 HOT Lanes from the reversible roadway leading north from I-285. Motorists continuing on Interstate 75 will reach Chattanooga in 88 miles. Georgia 5 also crosses the state line into Tennessee, 85 miles to the north. Photo taken 07/11/10. The first reassurance shield for I-575 appears along side GA 5 as the freeway pulls away from I-75. Forthcoming Exit 1 provides return access to I-75 via Barrett Parkway west by Town Center at Cobb mall. Photo taken 06/01/07. 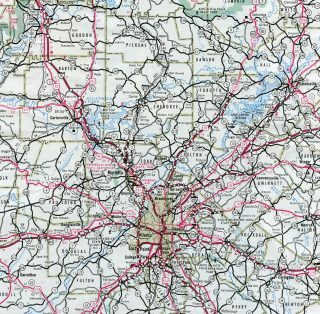 Research by Trent Legg of Georgia official maps and date stamps on bridges on Interstate 575, plus old newspaper articles. “Interchange, outlet shops excite Woodstock leaders.” Cherokee Tribune (Canton, GA), February 24, 2013. Page updated January 18, 2019.